The 'before' photo (right) is a 400 hz assembly as it arrives at our facility. This is a prime example of how customers have tied 1/0 cables into a form that acts like a band to keep the assembly together. The 'after' photo (below right) is the assembly following our remanufacturing process. 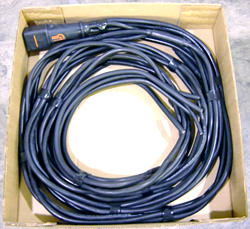 Our remade cables carry the same warranty for 50% of the cost. The assembly is completely cleaned, plugs cut off, bands removed, and terminal lugs replaced. Skyko remananufactured assemblies will work as long as a new assembly. We even throw in a bath to make the assembly feel rejuvenated before going back to work! Allow Skyko International LLC to play a major role in revamping up your corporate social responsibility and lower your carbon foot print. 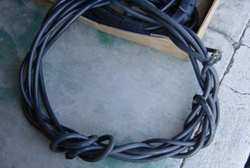 Recycling a cable assembly takes 1/30 of the energy it takes to mine the copper, make the conductor and insulate the product. And imagine this: it takes only one box for two cables to hitch a ride before it retires. Connect with Skyko International LLC and Go Green with our Choose to Reuse program!